One could argue that the Autism community is strong, but really it’s quite divided… one could also say that it’s very passionate but that passion is often what causes the division. One could say that it’s the amount of information that we have available and even make available ourselves but all too often, that information can be misguided, incorrect or down right deceiving. I think, the one element within the Autism community that is truly what makes it great is the support. No matter the differences, no matter the disagreements… we all find a way to console each other, uplift each other, give advice to each other and even, when necessary, donate to one another. Recently my wife’s laptop died which forced me to shift a desire into a need… I wanted an iPad for my boys but never made it a priority but when my wife no longer had a means of doing her work (online support), we needed to get her back online. And thus, the iPad became a need. So I made a donation page on my blog which resulted in our getting an iPad just a short month later. What’s truly great about this is that none of us have much money, we all have therapy, travels, diets and other things that take up a good chunk of our money but when someone within our community needs it, we all find a way to help out with an extra $10 or so. And that is never lost on the person who gets it… it’s never forgotten the sacrifice that it is to those that could have used that money themselves. 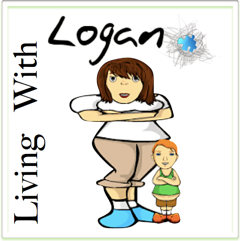 Caryn is the blogger at Living with Logan and tweets as @ihave7monsters… this name being specifically chosen because she is the mother of 7 children. One of whom, Logan, has Autism. Since starting her blog and becoming active on Twitter, she’s done quite well for herself in getting a readership but she’s still needing to take it to the next level. For that, she’s hoping to get some help to go to BlogHer, a convention specifically focused on women who blog and helping them to turn it into a business, or to just simply do even better than they already are. Caryn has started The Momma Project which is her drive to reach $1000 to get to the convention. If you have a little to spare, head on over and click on the Chip In button. If you don’t, perhaps share the link or spread the word… and in time, when/if you ever need it, Caryn, myself and everyone within the Autism community will “pay it forward” in an effort to help out where we can for you as well. On Twitter, I like to end each day by tweeting something a little positive, with the statement “Support is where you give it” as a reminder that we’re all helping each other. You have to be there with a kind word, some friendly advice or even a dollar or two if you can if you want to help keep the circle of supporting each other alive. Your little bit of support added with everyone else’s little bit of support makes for a very powerful support system that could one day be there for you when you need it.